Your morning roundup for June 13, the day some variation of "flippin'" made Sarah Palin's email word cloud. 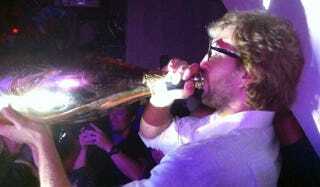 Dirk drinking photo via @skindoeshoops. What we watched: Our long national pomposity fest is either over, or just beginning: The Dallas Mavericks beat the Miami Heat 105-95 in Game 6 last night, Dirk Nowitzki was named the Finals MVP, and Mark Cuban ended his prolonged silence in the most Mark Cuban way possible. What we're watching: As much as we wanted the NBA finals to be Dirk vs. LeBron, or Dirk vs. Wade, it wasn't. It's a team game, and every position is equally important. Except for perhaps hockey, when a goaltender standing on his head can singlehandedly win it for his team. The media would like to tell you that tonight's game six is Luongo vs. Thomas, and they're not wrong. The storyline of this series has morphed from "overtime work for Mike Murphy" to the two netminders, from Thomas's pugnacity (shoving Henrik Sedin, hacking at Alex Burrows) to Luongo's inconsistency. (What time is it in Boston? Twelve past Luongo.) Finally, the two are sharing words. "It's an easy save for me," Luongo said of the game five winner. "But if you're wandering out and aggressive like he does, that's going to happen." "I have been pumping his tires ever since the series started," Luongo said. "I haven't heard one nice thing he had to say about me." A podiatrist writes in on the matter of LeBron's "sixth toe": "You asked for a podiatrist and you're in luck. The 'extra toe' you see is the lateral portion of the 5th metatarsal head. LBJ has what is termed a 'tailor's bunion'. What we see is simply the 5th toe rotated towards the 4th toe. Good news for haters, he will need surgery on that some day." Let the memes begin: Loss of the Ring via. We are all Dave McKenna CXXIX: Here's your daily link to Dave McKenna's brilliant "Cranky Redskins Fan's Guide to Dan Snyder," which we'll be posting until Snyder's dumbass libel suit disappears like LeBron in the fourth (shut up, us).